This training guide has been created by Pierre Mikhail founder and president of Muskoka Algonquin Runners (MARS). It outlines training details that will get you out and running and achieving a personal best at Band on the Run. 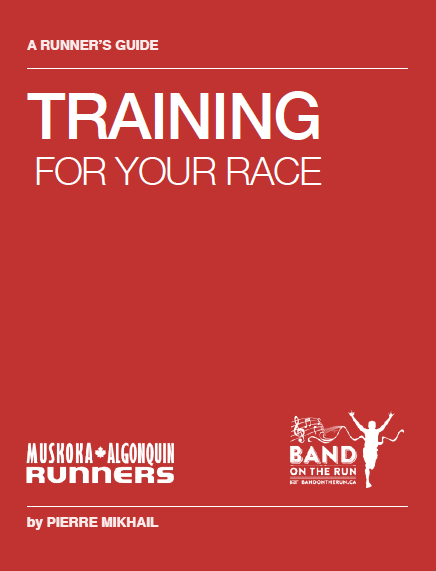 This guide has been created specifically for training for Band on the Run and our hilly Muskoka area. However – it could certainly be used to train for all sorts of different running events. You do not need to be a registered participant of BOTR to download it. Our goal is to create a guide that will help everyone on their route to a happy running lifestyle! Our training guide is free for you to use. please submit your name and email to download it. We won’t send you spam. We will send you periodic updates on Band on the Run stuff. You can unsubscribe at any time.